Mayor Rahm Emanuel called on the residents of Chicago and the politicians in Springfield in one of the most important speeches of his career Thursday as he laid out his three-point plan for fighting Chicago’s ever-prominent crime problem. The speech was delivered at Malcolm X College and included victims of the violence and crime and has long since plagued the city. “This fight is for all of Chicago, because it is Chicago’s future that is stake,” he said during the speech. Emanuel grew emotional at several points during the speech when invoking murdered 9-year-old Tyshawn Lee, Nykea Aldridge who was pushing her child in a stroller on her way to enroll one of them in school, and Arshell Dennis Jr., the slain son of a Chicago police officer. The mayor confirmed reported plans to add hundreds more sworn police positions within two years and the hiring of 500 new officers, a plan that could cost the city up to $50 million. After four people were killed and 12 others wounded Wednesday amid a spike in gun violence making national headlines, the mayor’s speech comes at a critical time in the city. Chicago Police Supt. Eddie Johnson says more officers are necessary at a time like this in Chicago. 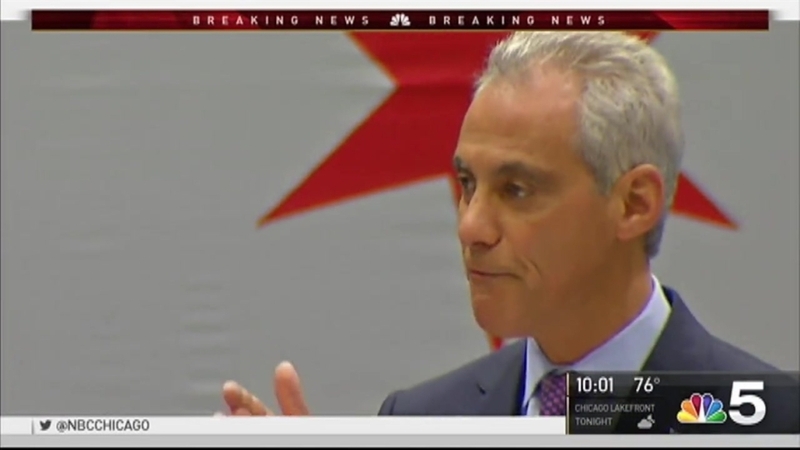 Emanuel’s speech also touted other methods for fighting crime like mentorship programs and job fairs for kids. “The best anti-crime program is a job, it’s that simple” he said. The mayor also challenged fathers and other role models to play a bigger role in their children’s lives saying that the only other alternative is for kids to turn to gangs. Emanuel said he will ensure there is room in the budget for “universal mentoring” for every 8th, 9th, 10th graders, with the help of sponsors like Jimmy Johns and Exelon. “We cannot afford to lose another generation to the gangs and the streets and the guns and the violence,” he said.